Teamwork - Midnight Blue sails upwind at Charleston Race Week. Photo by Lara Dallman-Weiss. The boat is technical, a blast to sail, and the level of competition is unparalleled compared to any other one design class out there today. But in spite of the level of competition, the fleet is made up of a fun group of sailors who are great to be with on and off the water. The boat really rewards consistency. It’s taken some time sailing with different crew configurations to return to something that feels good. You can sail these boats with three or four people, and for a while we were trying to sail with four people. This was our first event going back to sailing with three, but it was a crew who I’ve sailed with a lot. We were able to separate the two primary roles on board–boat speed and tactics–really cleanly, and I think that helped a lot at this past event in Charleston. What is currently your biggest challenge or goal? Before this weekend it was beating my dad! Otherwise, focusing on the big picture while racing without getting sidetracked if every detail isn’t perfect. We have to continue focusing on preparation to make sure our boat speed is there so we can rely on it while racing. We have a big world championship coming up early next year, so our winter season is going to be the big lead up to that. It will be exciting to have a lot of boats on the starting line for our three winter series events in Miami, followed by the Worlds in April. We’ve been using Quantum since Day 1 in this boat. Quantum has always had a very dependable package, but they’ve gone above and beyond to help us get the most out of our equipment. It’s great to have a good relationship around such an important part of the program. What are you most proud of about your team and program? 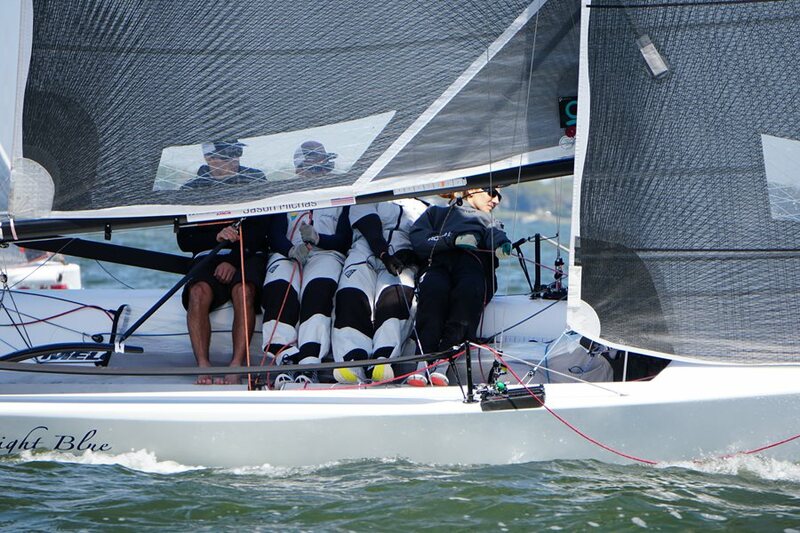 I’m proud we were able to win the 2018 Melges 20 Nationals against such a great fleet of competitors. We are good friends who’ve been sailing together for a long time. There was an incident many years ago where one of us was slapped with a piece of pizza while walking down Thames Street in Newport. What's the story behind your team name, if you have one? We needed to move away from ice cream flavors. My dad had a Mum 36 named Chunky Monkey and a Farr 40 named Phish Food. Needless to say they were not always taken seriously! What's your advice to a new team in the class or to other teams trying to succeed? Ask questions! Especially in this class, people are willing to help.